Over the years, Andy and I have had occasions where we’ve wanted to find each other in an unfamiliar place. Both of us have smartphones with GPS and navigation software, but sending a location and using the received location to navigate to always used to be a bit of a challenge. Then Google’s Latitude provided one possible solution - but only once you’ve set up who you want to share your location with. Here I Am 2 (for Android) and other similar apps allow a snapshot of current position to any email address or SMS number, but can be a bit fiddly to use. Recently, I discovered Glympse, and we’ve been using it partly for fun and partly for real while we’ve been away on holiday. The more I use it, the more I find it can do. You can select recipients either by clicking on the +person icon at the right hand side of the "Send a Glympse to" field to get a long list of contacts which you can then expand to choose a particular email address of phone number. Alternatively (and much more quickly) you can type part of a name, phone number or email address to use the lightning fast text matching to select a contact's details. You can repeatedly add recipients to send a Glympse to a number of email addresses or SMS numbers at the same time. Selecting the message bubble in the message field will retrieve previously used messages, and the destination flag will retrieve previously used destinations. Or you can type whatever you want in the field. In the case of destination, the fast text matching against your contacts will refine a quick pick list, or you can use the search button to match with whatever else the standard Google search can find for you. The recipient will receive an email or text message (whichever you sent) containing the link and either your personal message or the default Glympse message. On a PC or a smartphone without Glympse installed, clicking on the link will show the glympse in a browser. If Glympse is installed, you also have the option to view it within the application (which gives you the ability to compare their location with yours). What the recipient will see is the sender’s near real-time location, and a track of the sender’s route since they sent the Glympse. If a destination was included, you will also see an ETA, and if the user has set Glympse up to send it (which I believe is the default), you will also see their current speed, although I'm dubious as to how accurate this is sometimes. In tests I’ve done, the “current” location reported is typically anywhere between 5 and 30 seconds behind live - assuming the sender has a good data connection, of course. There is no way to set the frequency of updates, so be aware that this is going to be a bit of a battery killer unless you’ve got the phone on charge, e.g. in a car. I haven’t tested how much data it uses, but since it only needs to transmit your co-ordinates, I would expect it to be small. If a Glympse user chooses to track a received Glympse within the application, they will be able to switch between their own location and that of any currently active Glympses that have been sent to them, and in the case of others’ Glympses, you can see their location relative to your own. At the time of writing, Glympse is available for Android version 1.5 onwards, iOS, Windows Phone 7, Windows Mobile 5.x/6.0/6.1/6.5, and Blackberry. Any device (including PCs) with a browser can receive and track a Glympse. You can find links to download the application on the Glympse website. What happens when a Glympse expires? If a recipient looks at an expired Glympse, they’ll see the location that was current when the Glympse expired, but no track of the journey to that point. Uses range from the trivial to the potentially life-saving. On holiday in our Campervan recently, I was struggling to walk due to an injured ankle. We had walked around the town, but I just couldn’t go any further, and had to find a bench to sit and wait on, while Andy went to collect the ‘van. By sending a Glympse to Andy, he was able to drive to where I was in an unfamiliar town and collect me, and because he sent me a Glympse, I could also see how far away he was, and how long it was likely to take him to get to me. It was fun to be able to track his progress as he walked to and from the chip shop one evening too ;-). I’ve used it to keep family members up to date with my progress when I’ve been held up in traffic on my way to a meeting with people visiting their house. In case of breakdown it could be used to send an email or text message to your breakdown company or the emergency services, without even needing to know the email address or SMS number to send it to in advance. I have a shortcut favourite to Andy on my home screen with the destination set to home, which I can use as I’m leaving work, so he knows when to expect me home. That way, he gets something that’s so much more useful than a simple “I’m leaving now” message, as he can tell exactly where I’ve got to. 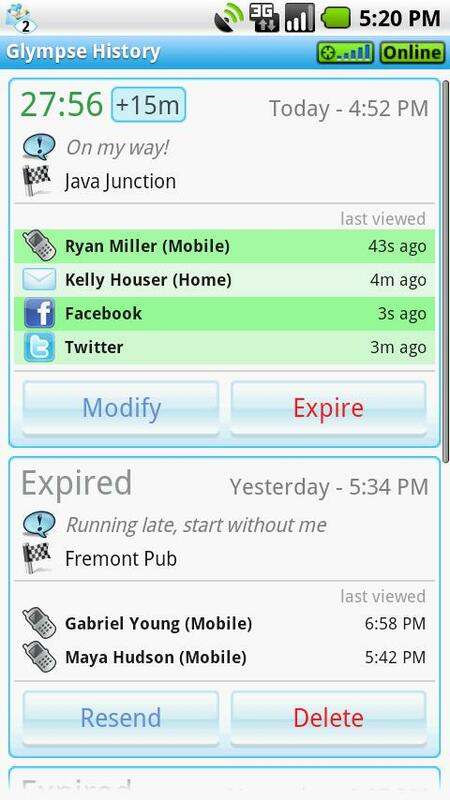 Glympse can be used to keep others up to date about your whereabouts when you’re meeting up somewhere. Each participant can send a private Glympse to every other participant, or (if it’s at a public venue) could post a Glympse on Facebook or Twitter. Next time there’s a PSC Pub Meet, we can all Tweet a Glympse on our way there, so we know who we’re expecting to arrive and when ;-). Disclaimer: I have only used Glympse on Android phones, but I assume that similar settings are available on other platforms. * Warning: For security reasons, unless your home address is already well-known to the world at large, I would advise against publishing a Glympse that involves travelling to or from your home, or one that includes your home as a destination. If leaving home, wait until you’ve got a reasonable distance from home before publishing your location. If travelling to home, don’t include your destination in a Facebook update or Tweet, and either set the duration short enough to expire before you arrive, or manually expire the Glympse before you get there. Similarly, don’t publish a Glympse including the home of any other private individual as the destination, as the name of your destination, including the name of the person if you picked it from your contact list, will be included in the Glympse. Don’t forget that even an expired Glympse continues to report what your location was at the time it expired long after the expiry date. 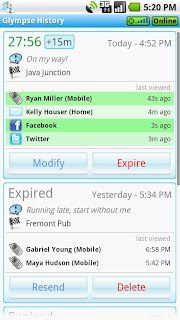 Any combination of recipient(s), duration, message and destination may be saved as a Favourite for future use. Favourites’ names by default include the destination, message, recipient and duration (in that order), but you’ll probably want to edit those down to something a little more snappy! Favourites may be accessed from within Glympse. You can edit a favourite’s name, but you can’t (currently) change any other details or reorder them in the list. You can, however, select a Favourite, change some details and then save the result as another Favourite. You can also create a homepage shortcut from a favourite - in which case you’ll definitely want a shorter name for it than the default one. Where Glympse falls down is that from then on there's no option to manage Favourites. You can explode the list to see the details of each Favourite, and Rename them or Delete them, and create a shortcut from them but you can't change the order of the Favourites within the list or change any of the shortcut details, and you can't add/change/edit the icon used. You can't expand a single Favourite to view or edit the details of just that one, either, so if you have found something you want to change in a long list, you'll have to find it again in the expanded list. Unfortunately, there is no way to export your Favourites or any of your settings to transfer them to another device. Maybe this is something that Glympse might consider in a future version? If the recipient of your Glympse also has Glympse and navigation software installed, they’ll get the option to navigate to your location. This passes the sender’s current location to Google Maps/Navigation (on Android phones, at least). However, if the sender moves before you arrive, Google Maps won’t know about it unless you re-set your destination from Glympse again. You can select History to see a list of recently sent Glympses, including all the details of the Glympse and the recipient(s), and when they last viewed your Glympse. The time of the Glympse expiry is also included (so if you set up Glympse to automatically expire Glympses when you arrive at your destination, or if you expire them manually, you automatically have a record or your arrival time too). Finally, you can resend a Glympse from this screen, which is just like using a Favourite - you can update any of the details before you re-send it. 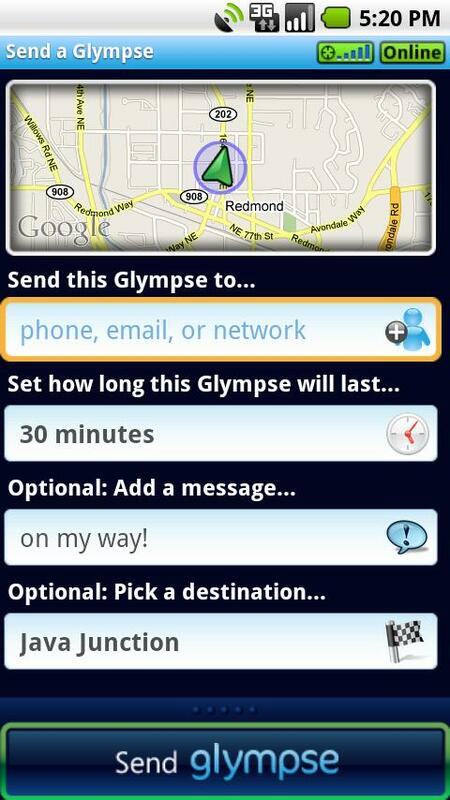 Unlike other Android location software, Glympse WILL keep your GPS active even when it’s in the background. For anything other than short Glympses, you’ll want to have your phone plugged into a charger if you don’t want the battery to die. This may be different on OSes that don’t have multi-tasking. Obviously, Glympse also needs an active data connection to be able to send its location data, so if you hit a reception dead spot, it won’t be able to update your position. Glympse is a well thought out and well-implemented idea, and a great way to let anybody with a browser know where you are without having to set up any social network or list of friends in advance. Support (if you need it) is also prompt, and helpful. There is no way to set the frequency of updates, so Daniel be aware that this is going to be a bit of a battery killer unless you’ve got the phone on charge, e.g. in a car.